45% burns in the line of duty. Recipient of the 2012 President’s Award for Gallantry. These are but some of the ways in which our Fire Champion, Ms. Priya Ravichandran, currently Deputy Director (Headquarters) of Tamil Nadu Fire and Rescue Service, can be described. Pongal – one of the most celebrated festivals in Tamil Nadu. A fire during the festival season, and in a Grade I heritage building was something that Priya, then District Fire Officer (Chennai City Central), least expected on the night of 15 Jan 2012.She was at the spot within minutes of receiving the information. The Kalas Mahal, Chepauk Palace, considered one of the still-in-use examples of Indo-Saracenic architecture, and having a history dating back to a period earlier than 1859, was on fire. This urgent need to identify the source of fire in order to prevent further disaster and possible death drove Priya to enter the burning building with a couple of other colleagues. While they were yet inside, the ceiling of the burning building collapsed on them. Priya managed to get out of the building but not before receiving 45% burns. The fire, which resulted in the loss of the life of one fireman, was put out after nearly five hours of focused work by over 70 firemen from the Fire and Rescue Services, 15 fire tenders and 30+ water lorries. An electrical short circuit was identified as the most probable reason for the fire. This is but one of the incidents of fire that Priya has dealt with in her career. Married to Shri S. Ravichandran, Additional Commissioner of Income Tax, Chennai, and a mother of two children, Priya has many achievements to her credit, both personal and professional. An MA in Sociology from Jawaharlal Nehru University, New Delhi, Priya was, right from her childhood, keen on getting into public service. Her ambition resulted in her getting directly recruited in 2003 as a District Officer. Was Priya the only fire officer posted in Tamil Nadu? Priya was one of the first two women recruited in the Tamil Nadu Fire And Rescue Services. She joined the force along with Ms. Meenakshi Vijayakumar, another notable personality from Tamil Nadu fire department. In fact, they are the first women officers, in the whole of India, to join the force through the TNPSC Group I. She has thereafter also been a board member of the TNPSC involved in the selection of Station Officers. Priya was the Team Commander for the Republic Day parade contingents in Chennai for the years 2008 and 2009. Working towards spreading the message of fire safety, she was also involved in the making of a short film on the Fire Department, and of ‘awareness’ movies on how to celebrate a safe Deepawali. As the sole representative of Tamil Nadu, Priya attended a Training Program on ‘Risk Management in industries ‘held in Germany and organized by the Government of India. She also underwent a month-long training in Urban Search and Rescue at the Prestigious National Fire Service College, UK. 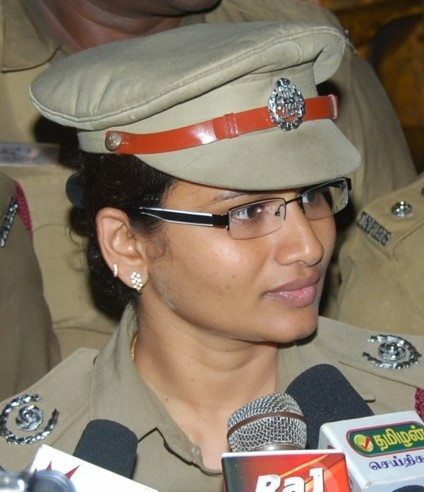 Post the Kalas Mahal fire, Priya received the President’s Medal for Gallantry – 2012. She was also the first recipient in her department to receive the Anna medal for Bravery 2012. Priya Ravichandran is indeed a Fire Champion. 1. Carelessness in the cause of an accident. 2. Ignorance is not bliss – learn how to act if a fire occurs. 3. Be aware and spread awareness. If you are a fire champion or know of one, write in!